Blog – Page 2 – What The Craft! We love decorative honeycomb garlands. They are both delicate and impressive. In our workshop a group can create lengths of garlands to use as decorations at your wedding. The same technique can also be used to create hanging decorations. We’ll tailor a workshop to your colour theme and provide any additional embellishments you might like including sparkle sprays, ribbons, crystals and more. Glass painting is a great workshop for all ages and abilities. Parties can make glassware for wedding tables including tealight holders and wine glasses. How about personalising some glasses for the wedding party to use in the day? We’re at the Edinburgh Wedding Fair at the Corn Exchange this weekend. It’s a great opportunity to speak to people planning their weddings. It’s such an exciting time for everyone and is a privilege to be part of it. We’re offering a 10% discount for any attendees so come out and see us at stand 19. A wedding can be a stressful and expensive experience. Why not involve your friends and family in helping you to prepare for the big day. 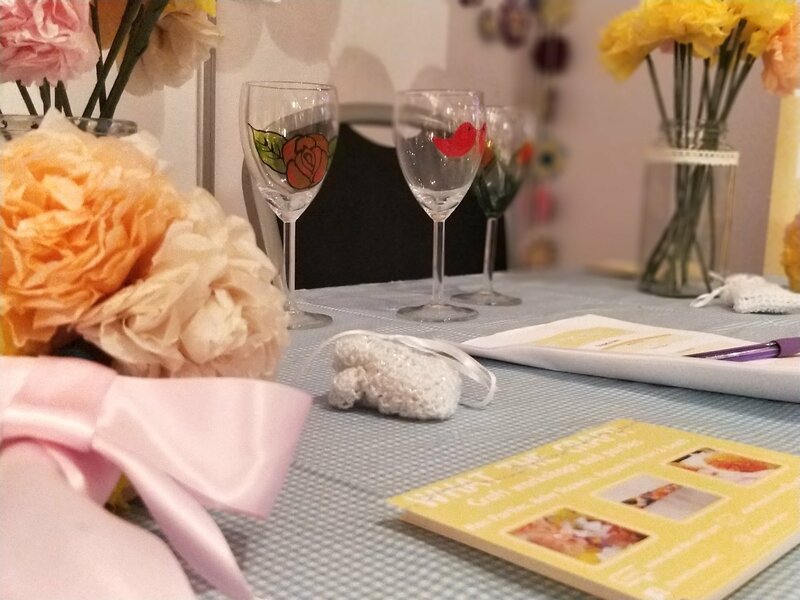 Our craft hen parties can help you to prepare a whole range of decorations for the big day, including tissue paper flowers which can be used for bouquets, posies, table decorations, buttonholes…anything you want really. Hens have a great time making the flowers and can enjoy seeing their work in place on the big day. Tissue flowers are great because not only do they look gorgeous but they can be tailored to your colour scheme, made well in advance of the day and set up early, reducing your stress on the day. Another lovely aspect of tissue paper flowers is that they can be kept for years as a keepsake from your wedding day. We love to help people create beautiful unique gifts. Our babygrow customisation workshop is a lovely way for friends and family to get together to celebrate the new arrival and make the mum to be some personalised babygrows. Once the little one grows out of these, they’ll be a lovely keepsake, or why not get in touch and we can make them into a patchwork quilt. We had a blast making these hot air balloons this week for a special little girl. In addition to paints, we can supply felts, applique, buttons and ribbons to help add texture to your creations. Get in touch to book your baby shower or use the form below to get in touch. 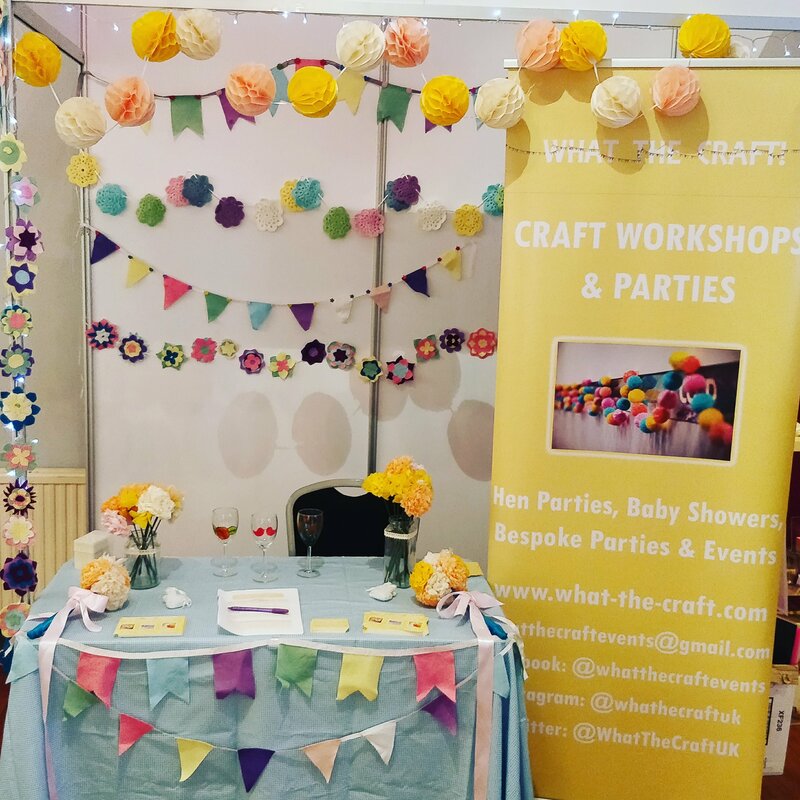 What The Craft was started by two sisters and works with some amazing women in craft parties and workshops. We’re passionate about forging a better working world for ourselves and the women around us. We want to provide a strong example of leadership and ambition. We’re inspired by the women that have gone before us, our mothers, grandmothers and teachers and we hope that we can offer the same inspiration to our own children. Teaching our boys to be respectful and to women and teaching our girls that they can achieve anything they set their minds to. Take today to celebrate the amazing women in your life and take the motivation to be a leader in your own right from now on, don’t be afraid to reach for your wildest ambitions. We were at the fantastic Edinburgh Wedding Fair at the Edinburgh Corn Exchange last weekend. It was a great opportunity for us to meet with new brides and their friends and family. The atmosphere at the event was lovely and we really enjoyed meeting everyone! The other exhibitors were also really lovely and helped to make our first time as exhibitors really fun! Hopefully we’ll get to see some of the people we met at one of our hen parties or baby showers soon! Get in touch for bookings/more information.